Las Vegas is known as the the Entertainment Capital of the World, America's Adult playground, Sin City, but it sure didn’t start off that way. The dry piece of desert was named in the 1800’s by the Spanish, who used it as a watering spot along the Old Spanish Trail that connected Los Angeles with Santa Fe. The name translates as The Meadows due to the lush grassy meadows that grew around the springs. But the Spanish didn't build Las Vegas. They just passed through on their way to Santa Fe. Later on, the railroad and mining industries built the path to make it easy for mobster Benjamin "Bugsy" Siegel to take over and with the "famiglia", build Las Vegas the way we know. 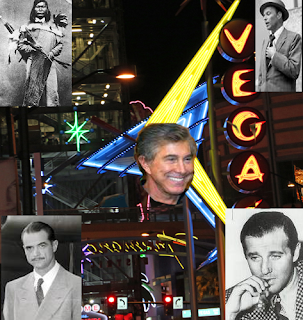 Later on came Howard Hughes, The Aviator, who changed Las Vegas into a corporate city, which Steven Wynn transformed into a mega resorts. We cannot forget the Rat Pack, lead by Sinatra, who reigned in Vegas for 43 years, transforming the western-feeling town into a glamorous one. Ol' Blue Eyes started his career early being arrested twice. For what? Seduction! And we got seduced by such a metamorphose, that we end up forgetting where the name of the Las Vegas came from.